Construction Vehicles, Backhoes, Telehandlers, Bucket Trucks, Forklifts, Etc. 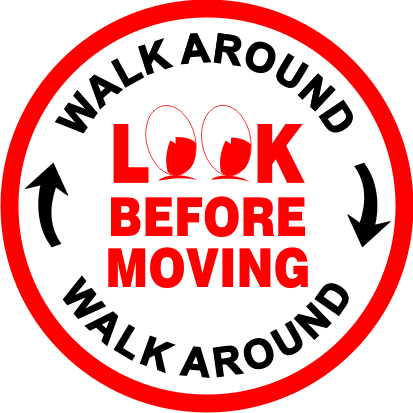 Our Walk Around Vehicle Decal is HUGE...5.75" diameter...if you are ever sued, this decal will prove, more than any other thing, that your employees KNOW THEY ARE TO ALWAYS LOOK AROUND VEHICLES BEFORE THEY MOVE THEM. YOU WILL HAVE PHOTOGRAPHIC EVIDENCE THAT YOU DID EVERYTHING IN YOUR POWER TO AVOID DAMAGE TO PROPERTY, ANIMALS, AND PEOPLE. 1) Most decals available on the internet have a topcoat which is a laminate, that is, a separate clear film glued to the decal surface. One of the BAD features of laminates is moisture gets between the layers and every time you wipe them, a little more dirt gets between the layers, and over time, water seeps between the layers until the decal is damaged, and must be replaced. 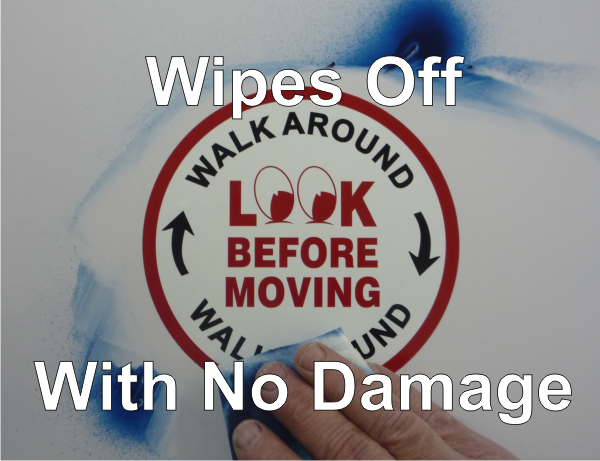 Our Walk Around Vehicle Decals do not have a laminate topcoat... Our Walk Around Vehicle Decals have a screen printed topcoat, so the topcoat will never be damaged by wiping. In fact, the topcoat on our Walk Around Vehicle Decals is so impervious to solvents that it can be cleaned with gasoline! most vinyl decals on the internet. This means our Walk Around Vehicle Decals will stick to even old vehicles like Backoes, Telehandlers, Forklifs, etc..
Our Water Around Vehicle Decals are $6 for one, $12.00 for three, and $36.00 for 10 decals, with FREE shipping. * The color, shape and size of the decal is designed for maximum emotional impact. After all, a decal that is not seen and "felt" will not influence people to do the right thing. IF YOUR EMPLOYEE DAMAGES PROPERTY , PERSONS OR PETS, YOUR COMPANY IS LIABLE. MANY INSURANCE COMPANIES REQUIRE CLIENTS TO PLACE THIS TYPE OF DECAL WHERE EMPLOYEES CAN SEE BEFORE THEY MOVE A VEHICLE. THIS DECAL IS HUGE...5.75" DIAMETER AND COMPELLING...EMPLOYEES WILL BE COMPELLED TO LOOK AT IT AND BE REMINDED TO DO THE RIGHT THING. MADE IN OUR FACTORY HERE IN THE GOOD OLD U.S.A...you can not find a higher quality decal.